On the way to the airport the train is fairly full, all the seats seem to have been booked. Luckily we booked ours in advance. A couple of ladies get on and go to the last two remaining seats. There is nowhere to put their big suitcases, so they wheel them into the space between the seats where your legs might usually go. 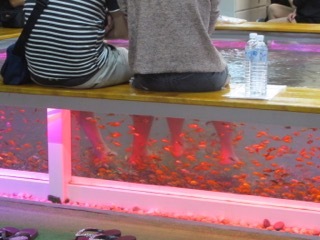 They then slip off their shoes and climb onto the seat and sit cross-legged in that narrow space for the one hour, 45 minute journey to the airport. They sit and chat comfortably for the whole trip. I’m impressed. At the station, just before we left, Betty/Buffy/Katherine found a beautiful little place hidden away where there was a red stamp to celebrate our visit to Kyoto station. We have made a point of collecting all of these where ever we find them. They are really for children, but we like to amuse ourselves by collecting them when we come across them. They go into our travel journals and remind us of our visit to various places. 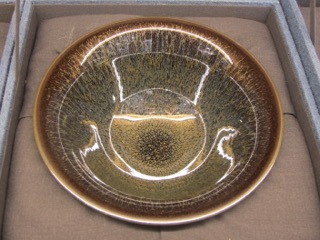 We got one yesterday from the Museum of Oriental Ceramics, to celebrate our visit there. This one comes with its own special sheet of paper with a circular gap in the printed matter to allow for the bright red imprint. I’m childishly thrilled with this little unexpected parting gift from Kyoto. 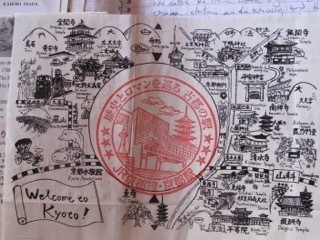 As we are leaving now, this will be our last red stamp from Japan. Except maybe the one in our passports? We arrive at Kansai airport very early and in good time, which is lucky, because it takes over an hour at check in with Poverty Air. First the machine won’t accept us and says to go to the counter and get help. The lady at check-in is lovely and very helpful. She sorts it all out, but it takes a long time. 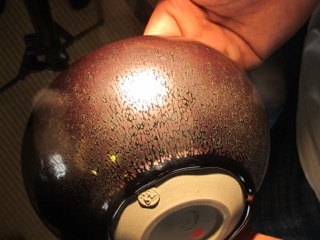 Every detail has to be checked and re-checked. Some of the problem is about my forward ticket out of Taiwan. I only have an electronic ticket and not a paper printout. So I have to open my lap top, boot it up, and show her the confirmation email, that I have an onward travel ticket out of Taiwan, before I can get a boarding pass onto this plane to go to Taiwan. Finally we get through customs, immigration and security and find our selves in the oldest part of the old terminal, that has been given over to Poverty Air – instead of demolishing it! When we get there we find that there isn’t a departure terminal as we know it. Just a few chairs in an empty space. 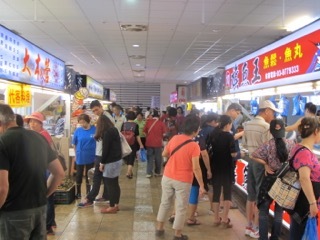 There is however a noodle bar that is selling ramen noodles, hamburgers, hot chips and beer. Not what I feel like early in the morning. So I give it a wide birth. There is a sign outside that shows sandwiches and coffee. I point to the sign. The man nods and hold up his hands in a cross pattern. Coffee and sandwiches are off today Luv! He walks out of the bar and picks up the sign and removes it to a small passageway beside the cafe. Coffee and sandwiches are definitely off today Luv! But Hey! This is Poverty Air, what was I expecting. I chose it of my own fee will. I’m not going to complain. The ticket price was half that of the other companies. I’m not expecting any service on the plane, but I was thinking that there might be a place to stock up before boarding. There was, but that was in the other terminal. That was then and this is now. There is no going back, so I have learnt something. Either eat something at 5.00am, even if you don’t feel like it, or wait till you get off the plane and have some lunch when you get there. I can live with that. The 400 dollar difference helps to convince me of it. We eventually get onto the plane and while we are sitting in our seats, waiting, it sounds as if there is a man working underneath us putting the last few screws into the fuselage with a battery drill that is almost out of battery power. It whirrs and grinds slowly, on and on, ‘rhurm’, ‘rhurm’, ‘rhuuuurm’, finally grinding to a halt and stopping. I hope that he got that last piece of fuselage screwed down before the battery went flat. I’d hate to loose a vital piece of the outer coating at full altitude. After a few hours on the plane, The Lovely and I are starting to feel a little peckish, so we decide to have a beer. The girl comes around and sells us one for $7 this is reasonably expensive for a half sized can of beer, but it’s much cheaper than the beer up at the top of that Hotel in Singapore, and we are much higher up than we were then, so it’s sounding cheap! That is if you think of it as if you are buying altitude and not beer. Soy sauce, sugar, flour, protein hydrolate, chilli powder, bonito extract, vegetable oil, green laver? Glutinous rice, soy, almonds, almond oil, salt, MSG, peanuts, starch, cornflour, rice, high fructose corn syrup, powdered sugar, powdered chilli pepper, modified starch, seasonings, amino acids, colourings, paprika pigments, monascus?? 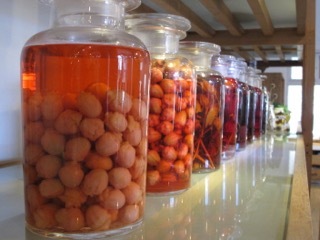 spice extract, and wheat and soya bean products. WARNING! May contain milk or egg products! After reading all that list of chemicals. The last thing that I’d be worried about would be any milk or egg! We are on a big AirBus, but the cunning accountants in conjunction with the engineers at Poverty Air have returned from Ireland after studying with Ryan Air and contrived together to reduce the space between the rows of seats to just 240 mm. My knees are touching the magazine rack of the seat in front. The solution is simple, the engineers will remove the magazine pouch. There is only a safety card in there anyway. You have to rent a magazine, if you want one. Our flight has a lot of turbulence but is otherwise uneventful. There is no charge for the turbulence! Our second free gift. Katherine Hepburn and I arrive in Kaohsiung, Taiwan. 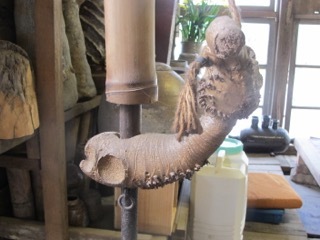 I’m here to give a masterclass and a couple of presentations about my work with ‘wild’ materials, and I also have work in a show of Ikebana pots here. This is work that I posted over here ahead of us. Everything has arrived safe-n-sound and undamaged from its international postage trip. It all goes well. 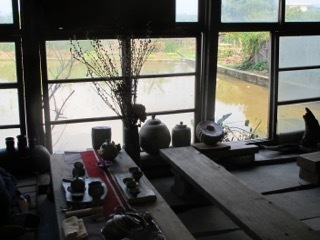 While we are here in Kaohsiung we get taken to visit the studio/home of local legend Chang Quei Wei. 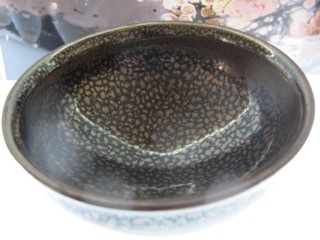 He is famous for his oil spot tenmoku glazed tea wares. 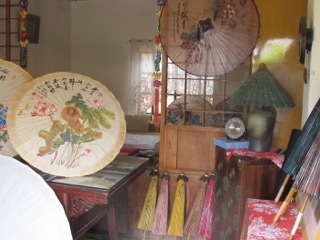 We are shown around and are invited to stay for tea. 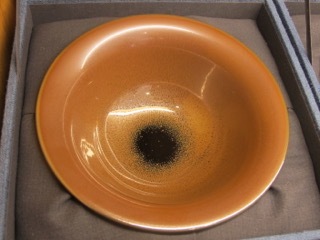 We get to use his lovely bowls. 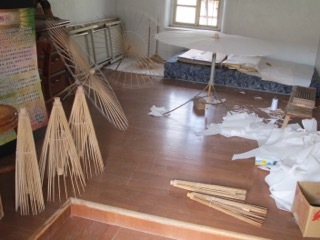 We visit a handmade, bamboo and paper umbrella workshop. It’s a small husband and wife team, working from home. 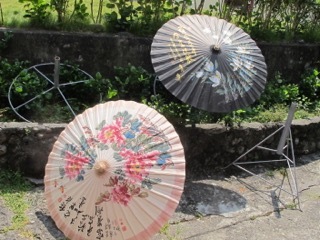 All the umbrellas are hand painted. We stop off at the beach in the afternoon on the way home where the Divinity of The Lovely Saint Nina (Betty/Buffy/Katherine) suddenly becomes apparent. As she blesses her friend Jo. Interestingly, the sun doesn’t set here in Taiwan. The pollution is so bad that the air quality is such that visibility is reduced to just a couple of kilometres during the time that we are here. You just can’t see anything in the distance, even office blocks across the city, fade away into grey invisibility as they recede. A range of hills doesn’t go to off into the distance, but just disappears into grey shadows and become invisible. 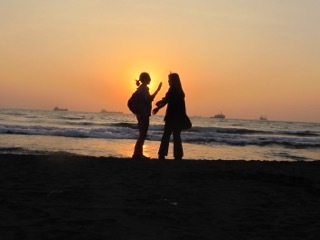 So when the sun sets. It sets high up in the sky, about 15% above where the horizon ought to be. The sun just slowly becomes more and more orange, then dull brown as it approaches the 15 degrees level, and finally becomes invisible through the thick brown haze. It’s there. The sky is still light and remains so for another hour until the sun finally sets over the horizon. It’s a really weird sensation to see the sun turn dull and brown and become invisible while still ‘up’. The next morning, The Divine St. Nina The Forgetful departs for the Airport to go back home to Australia – with her passport! While I catch the high speed train from Kaohsiung up to Miaoli. 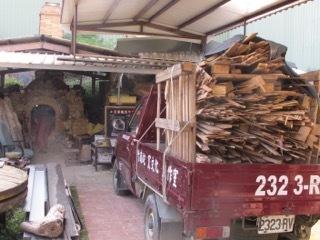 To go to the Snake Kiln Centre for the final part of my trip. It’s a very fast and comfortable ride, and quite cheap. I am here to take part in an international seminar called ‘Master Meets Master’. I don’t know how come I got chosen. 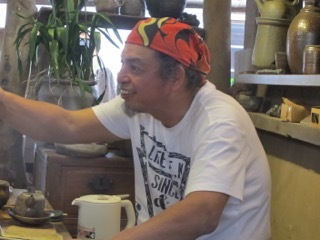 I don’t feel like a ‘Master’, I feel more like a Journeyman, permanently trying to complete his studies, but I’m happy to be included, as it fits in very well with our trip around Asia doing conferences, workshops, firings and some teaching. I am finally in the right place at the right time! 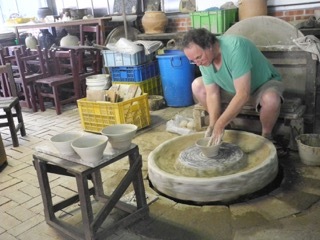 The concept is that there will be 10 ‘Master’ potters from around the world. 5 from Asia, and 5 invited internationals. I’m here representing Australia? 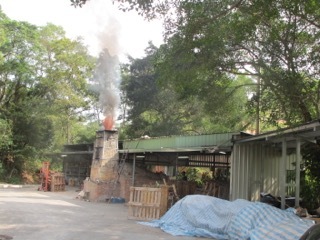 We will be hosted at one of the only two remaining snake kilns in Taiwan. 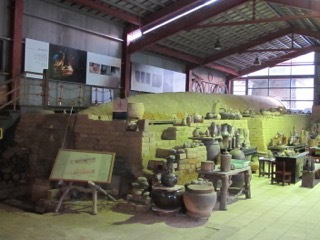 This one is located at Zhunan, near Miaoli. 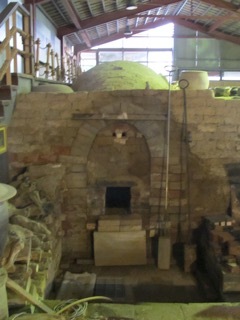 There will be time to work and make pots and then a firing in one of the many kilns here at the Centre. 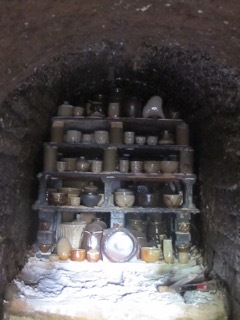 While the kiln is cooling there will be a conference around the theme of ‘tea’ and then an exhibition of our work. 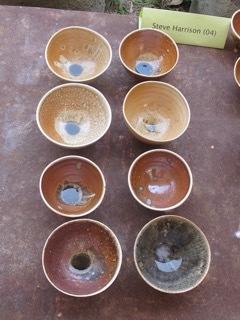 I will also be giving a Masterclass on making glazes from local materials. I am here for a few weeks in all and as The Divine St. Nina The Forgetful has departed for home. I get to share a room with Chang Quei Wei. One night it becomes apparent that he has just been made something like the equivalent of a ‘National Living Treasure’ here. 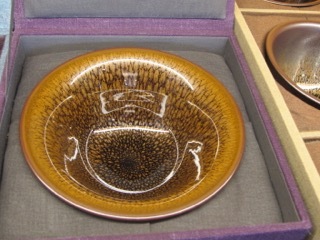 He is the first living potter ever to have his work purchased by the National Imperial Museum during his life time. Quite a big achievement for him and not without some controversy either it appears. He is whisked away to do television interviews and to be filmed by a Chinese film crew for a documentary about him in China. I get the impression that his career is now made! 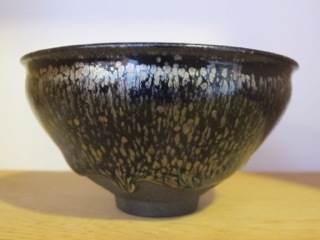 The good news for me out of all this, is that last year when I was in Kaohsiung for the Tea Bowl exhibition, I visited him at this studio and bought one of his small oil spot tenmoku bowls. I get the impression that it has just jumped up in value quite considerably! 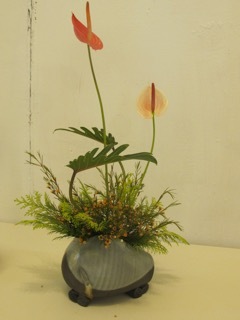 In the morning, I set about making some work. 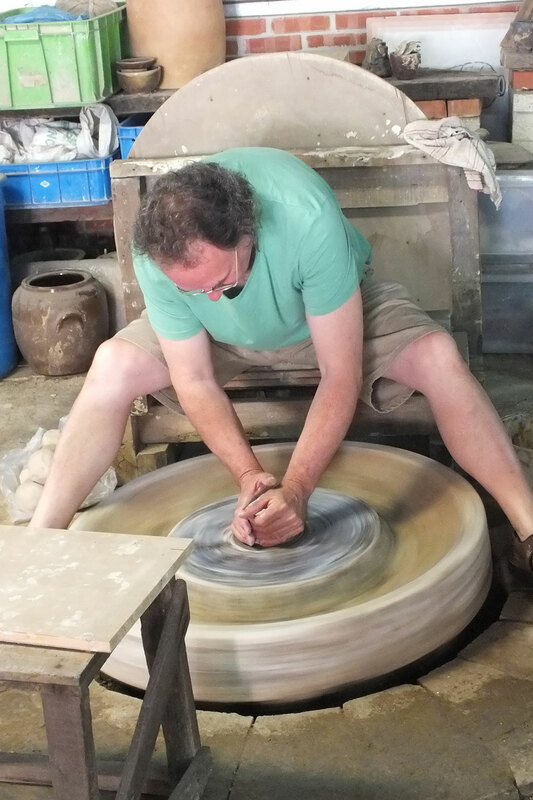 I choose to make my pots on the traditional floor mounted kick wheel. There is only one in the workshop and nobody else is interested in using it, so I do. 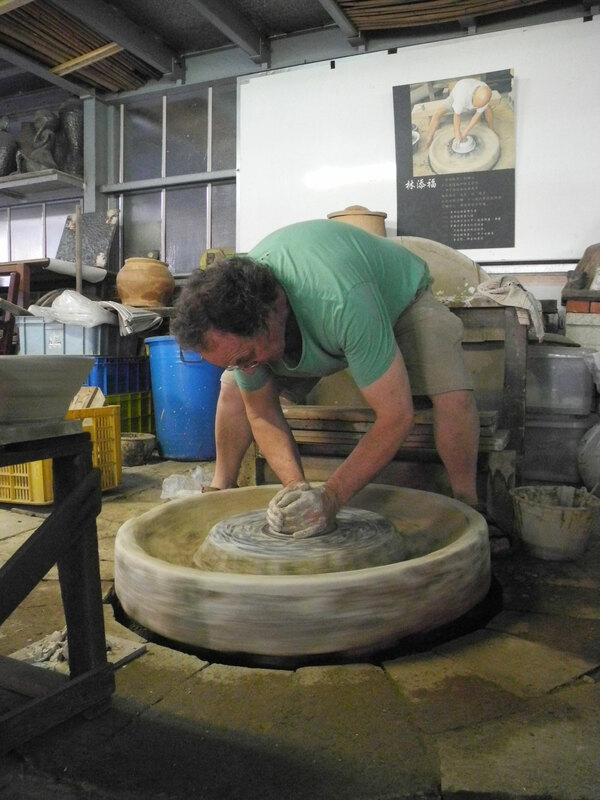 It’s quite a torturous position to throw in, but it helps to create a nice quiet feeling in the pots, as they must be thrown at a very slow speed, but quite ‘quickly’ or economically of energy. The slow speed imposes a very strict set of imperatives to complete the form in the given time, or should I say with a set amount of kinetic energy. I really like the natural restrictions set by the technique and respond well to it. The rims must be finished while the wheel is almost slowing to a halt. It really makes me concentrate and the day goes past in a flash. 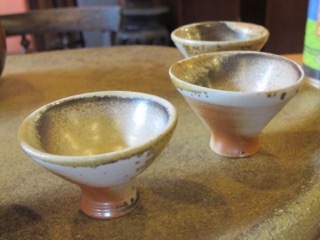 It is quite hot here and not too humid, so the work dries quickly and I am able to throw my bowls and turn them on the same day. 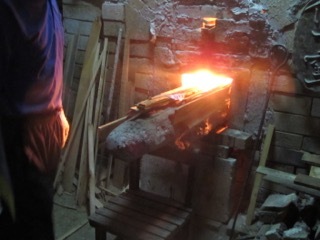 We have 4 days for making, and then the kiln will be packed and fired. 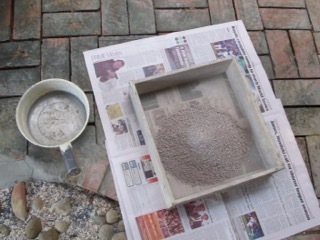 I also have to locate some local rocks, find something to crush them with and make some test tiles to fire the test glazes on. It’s a big ask. 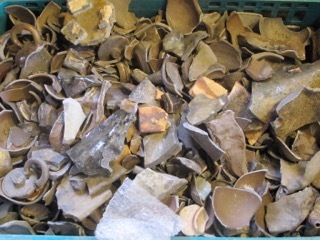 I get all my pots made in the first 2 days, so that frees me up to be able to search out some local rock that might be suitable for making stoneware glazes. 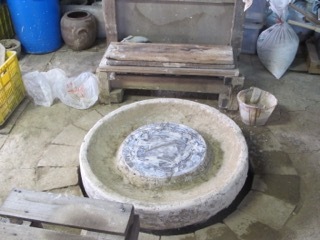 There is no surviving tradition of using locally sourced ceramic materials here. There used to be, but all the information is now lost, as the old timers have died, taking all their knowledge with them. There is no longer a continuing tradition. So I am starting from scratch. 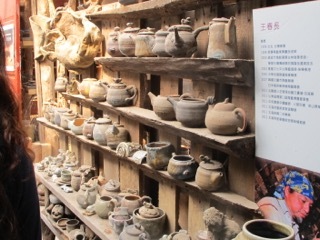 The clay used to come from the site here where the kiln is, but that was a long time ago, when it was out of town, but now the town has come out to engulf the pottery and the site is now completely surrounded. On one side by towering high rise apartments and on the other 3 by huge industrial factory buildings. 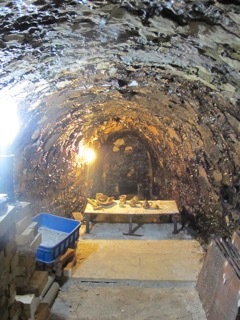 There is only enough room left for the pottery building and kiln sheds. 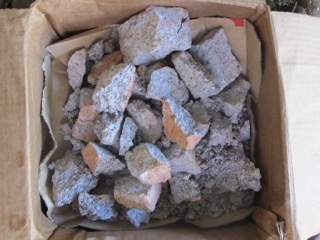 We get some granite chunks from a local sculptor, but there is some interesting gravel in the path out side the pottery. The little stones look like they may be of some interest. 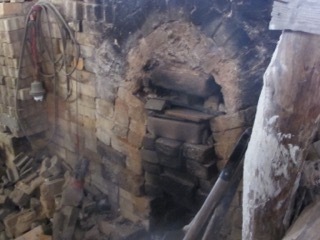 There is plenty of ash from the firebox of the kiln. 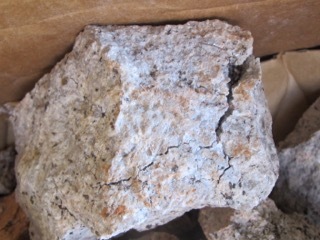 The granite needs to be calcined in the little kiln first to weaken it, so that it will spall and be easy to crush. I also need to find something to crush it all with. I have just two days to get all this organised and completed before my masterclass. Miraculously, everything gets done – with a lot of help! 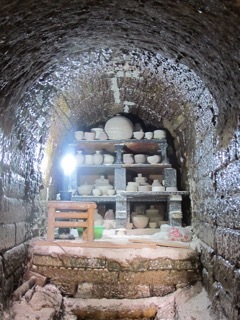 The kiln gets packed with our damp pots and there is a 24 hour preheating, up to 160oC . 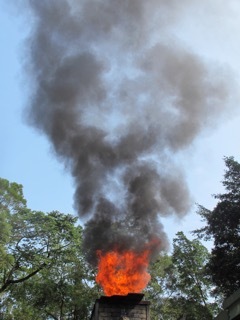 This is followed by a two day firing, up to 1400 oC! 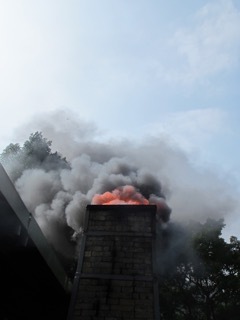 Yes, that’s what the pyrometer said! 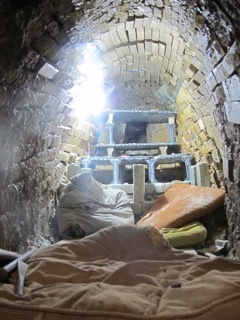 The kiln is then held at, or between, 1350 oC and 1380 oC for another 12 hours or so, before being closed down and left to cool for a week. The timber used is 50% huge logs collected off the beach as drift wood and 50% very thin softwood off cuts from local timber industries. This appears to be a mix of particle board, plywood and imported SE Asian fine grained softwoods used for cabinet work. A complete mix. 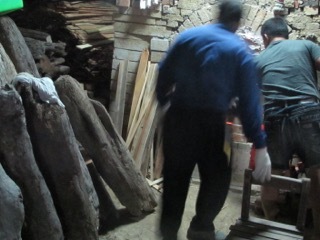 The use of huge salt impregnated driftwood logs collected off the beach means that what we are really doing here is a woodfired saltglaze firing. 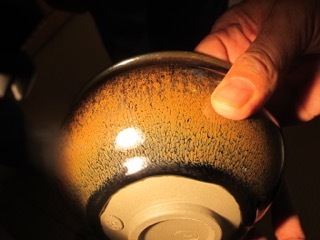 While the kiln is cooling, we go out on a trip to the East Coast and then up around the North coast, before circling back around and down, visiting various local potters and sites of interest. 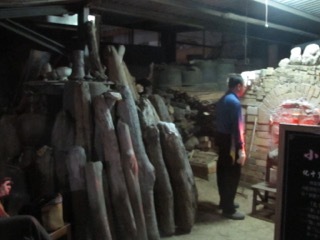 We visit a family that makes a range of woodfired ceramics. 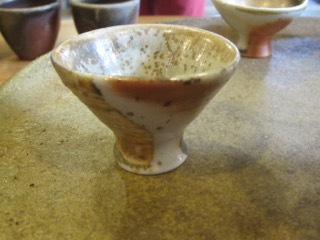 I’m particularly taken by the very small tea cups used here in the Taiwanese version of the tea ceremony. Their work here is so very delicate. 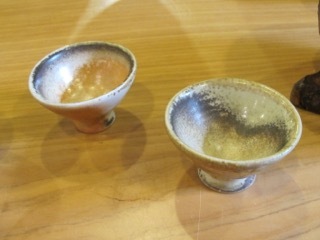 I want to buy one of these cups, but they are not for sale. 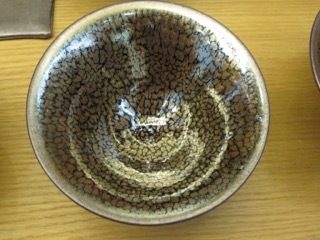 Later, we call in at an Art School, Ceramics Dept. Where they are half way through a multi-day firing of an anagama and are very proud of the massive reduction that they are achieving, but the air is already so bad here in Taiwan, you can only see for about 2 km before everything disappears into a grey, foggy haze of photo-chemical smog. 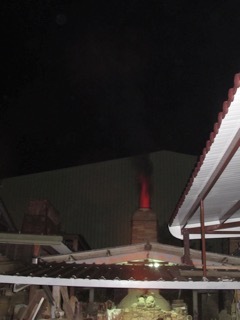 I really think that they should be looking at other ways of firing that are cleaner. 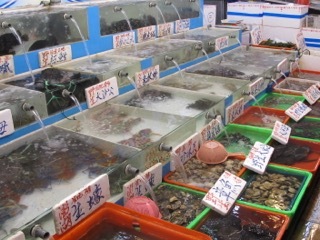 We call in at the local markets, always an interesting place to spend time looking. 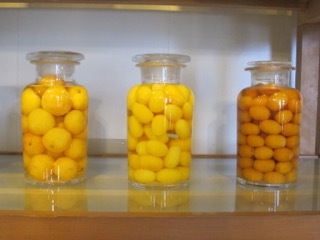 And later to a fruit factory, where they sell preserved fruit. 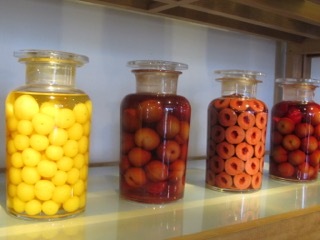 I’m not tempted to buy anything, as this is what The Divine Miss N and I do at home each summer, but their product looks very pretty in it’s jars, so I photograph it. 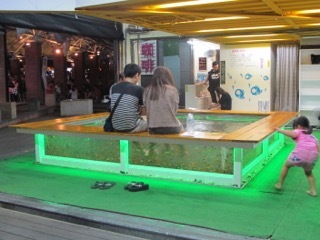 In the evening we stop at a resort town where the local attraction is the hot springs. 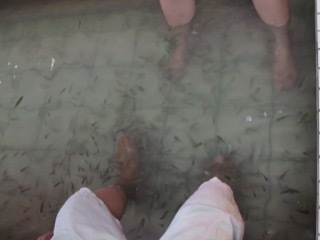 It’s a little bit unusual here, because the main attraction is getting the dead skin eaten off your feet and legs by teeming schools of tiny fish, as you dangle your legs in the warm water. 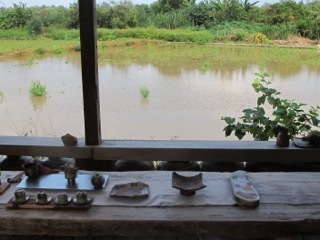 We call in on an interesting potter who has his workshop out in the countryside, in an old ramshackle building next to paddy fields. Hi name might be Wang Chun Chang? I hope that’s correct! He works in a kind of organised chaos. 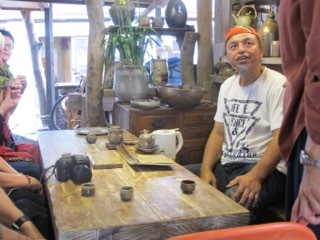 He‘s a really friendly guy who welcomes us all warmly into his workshop and gives us tea. He clearly has a very creative spirit and I’m touched by the untamed creativity of it all. I just couldn’t work this way. Maybe I’ve got Aspergers or something, but I need a few clean flat surfaces around me to work on. Never the less. I really warm to him, this place and the artistic, creative spirit that has created it and is so apparent everywhere – even in the chaos. 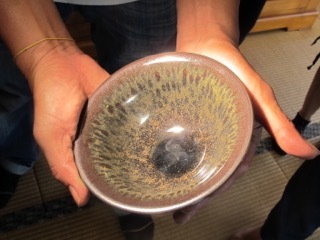 The next potter that we get to meet is a very well known, tenmoku potter. Chiang Yu-ting. He doesn’t seem to exhibit any more. Apparently he gets enough wealthy patrons coming to him now, such that he can make a very good living from occasional sales from home. His work is very slick, very professional. The prices of his bowls are also very high. 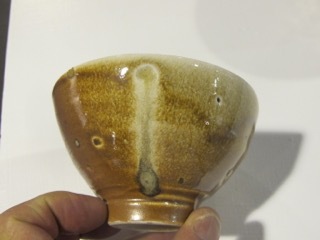 Au$15,000 each for his very best works, Au$5,000 each for good pieces and Au$1,200 for little cups. I must say that I’m impressed. 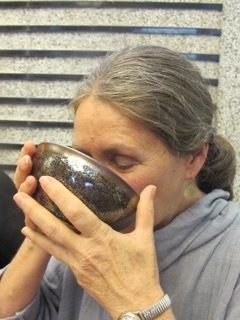 The work is good and it’s great to see someone being able to make a good living from their pots – and the twenty years of research that led to them. 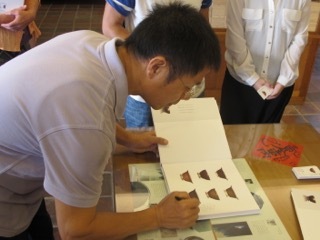 God only knows how much Quei Wei’s work will cost in the future, now that he is a living legend? 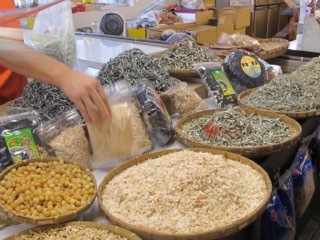 We return to Miaoli and I go back to my usual routine, that I have been indulging myself in. 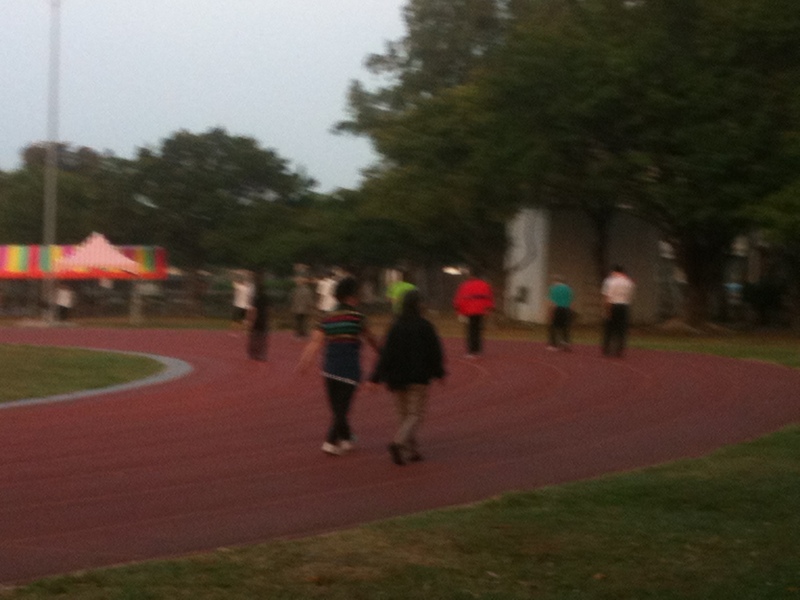 Each evening after work, I join in with the many locals who do yoga, Tai chi, walking and running around the local sports field. 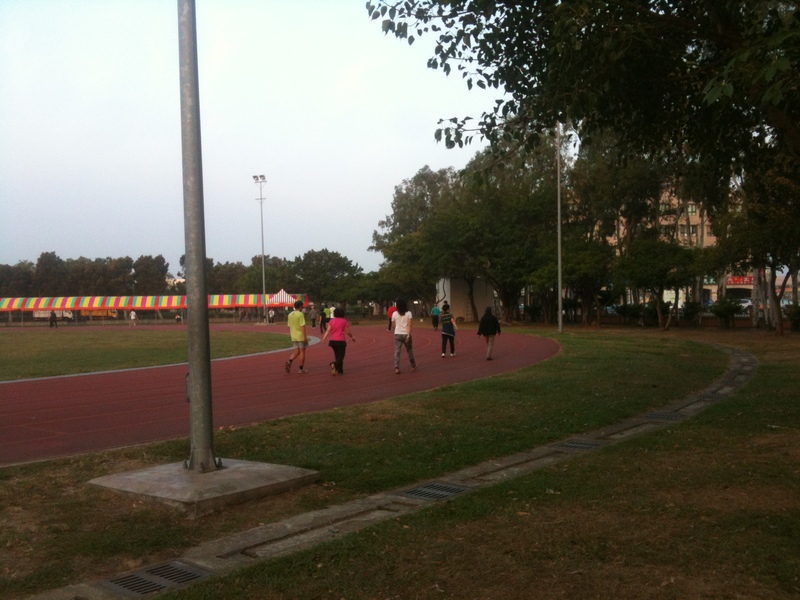 The running track seems to be about 500 metres all around, so I join all the others in a brisk, but steady walk around the circuit. 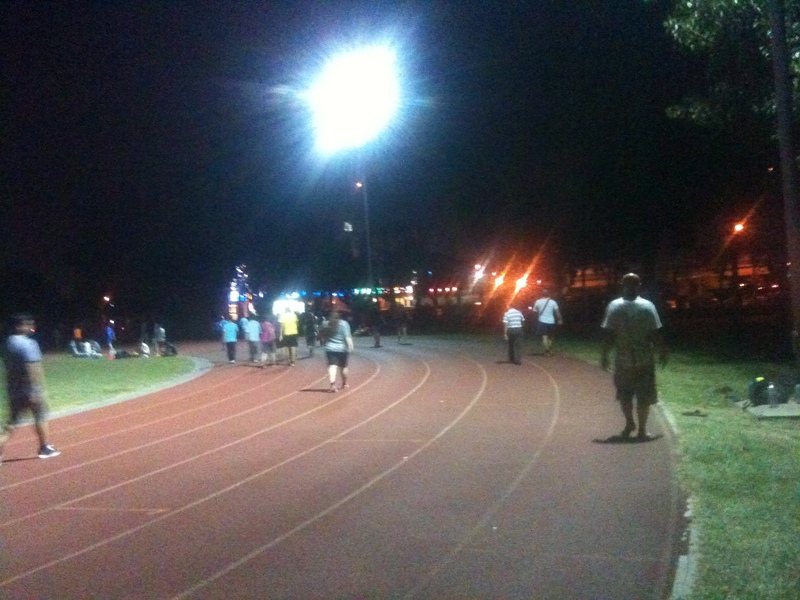 I do about 10 or 11 circuits, which I think should be about 5 kms. but I tend to loose track of time while I’m in the zone, engaged in my own thoughts, so I do an extra circuit, just to make sure. It takes about an hour. Then I go in for a good breakfast. In the evenings a I do the same again. I feel really good after the gentle workout and I feel somehow engaged with all the others, even though I can’t speak a word to them all. We are all doing the same thing for our own reasons, individually, but all together. 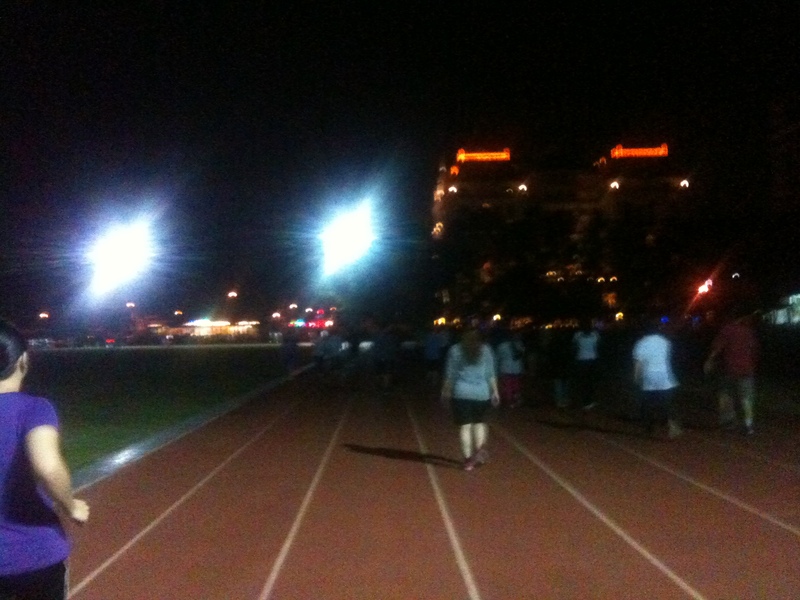 I feel really energised afterwards and always sleep well. 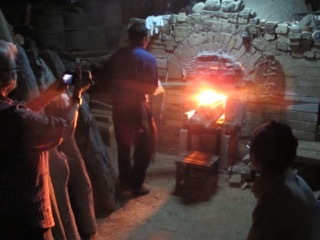 We eventually return to the Snake Kiln Centre for the unpacking of the kiln and to set up the exhibition of our tea wares. 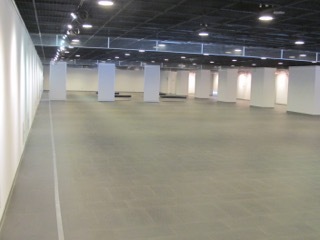 The Gallery is huge. It’s an intimidating space for such small works. 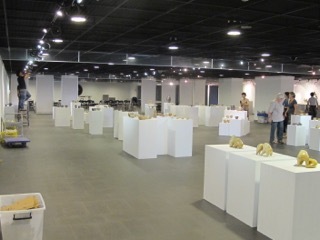 There are sufficient plinths to display all the work and by the evening it all looks very good. There are a lot of other places to see and to go, but I have a lot of work booked and lined up for me to do when I get home, so I don’t hang around. I need to be back home with The Lovely, Divine, Saint Nina, The Forgetful. 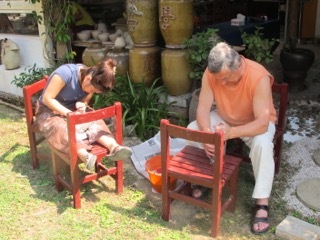 It is already bush fire season and she is there with Annabelle Sloujetté, who has been looking after the house and pottery in our absence. So I take my leave from Taiwan and hop on the long, roundabout, multi-stop, red-eye, flight with Poverty Air back to Sydney. 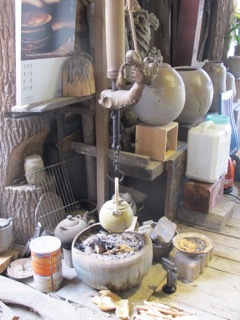 I’ll be very happy to be home again, back into my own pottery and garden. It’s been a very long journey. Fond regards from The Lovely, Devine, Saint Nina (Betty/Buffy/Katherine) The Forgetful and her Journalist Journeyman. 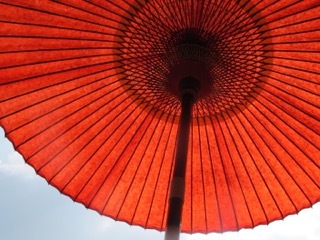 This entry was posted in Uncategorized and tagged Taiwan by hotnsticky. Bookmark the permalink.